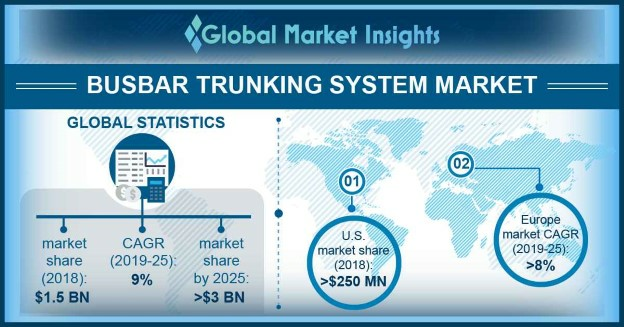 Busbar Trunking System Market size will surpass USD 3 billion by 2025, as reported in the latest study by Global Market Insights, Inc. Stringent government regulations to curtail the transmission & distribution losses along with increasing demand for uninterrupted & reliable electricity supply will drive the market growth. In addition, increasing adoption of smart grid coupled with accelerating investments toward infrastructural development will stimulate the industry growth. For instance, Saudi Arabia has planned to invest USD 1.1 trillion on infrastructure projects from 2019 to 2038. Ability to offer high flexibility, easy installation, and customized design will fuel the sandwich busbar trunking system market. Furthermore, increasing demand for the replacement of traditional cables systems for power distribution coupled with the ability of these systems to effectively utilize space will drive the product adoption. The U.S. market was over USD 250 million in 2018. Rising demand to replace the obsolete power cables coupled with regulatory measures to modernize the existing grid infrastructure will propel the industry outlook. Extensive applicability across industrial & commercial establishment on account of low fire load and high degree of flexibility will stimulate the low busbar trunking system market. High suitability across airports, shopping complexes, logistic storage & warehouses, railway stations, and production & storage spaces on account of providing hassle free power distribution will further propel the industry dynamics. The busbar trunking system market from aluminium, will grow over 11% by 2025. Ability to carry heavy loads over long distances along with their cost compatibility will drive the product adoption. Continual technical improvements in the quality of these systems to enhance the environmental credentials will further complement the business outlook. Rapid industrialization along with increasing demand for power majorly across the emerging economies will stimulate the market. Increasing electricity demand from growing number of data centers along with enhanced government efforts to modernize the existing transmission networks will further complement the business landscape. In 2016, data centers consumed around 416 terawatts (3% of the total electricity) globally, nearly 40% more than the consumption of the entire United Kingdom. Enhanced efforts to develop the railway infrastructure capacity along with the implementation of policies to ensure proper transport infrastructure will substantially boost the transportation industrial busbar trunking system market. Allocation of funds to finance investments for the modernization of railway transport infrastructure across various economies will positively impact the business scenario. Europe market is anticipated to expand over 8% by 2025. Growing emphasis on the adoption of energy efficient systems to curb the T&D losses along with increasing electricity consumption will augment the industry dynamics. In 2017, the electricity consumption grew by 0.7%, marking an increase for the third consecutive year. Furthermore, the European Union (EU) has set energy saving target of 20% by 2020 to meet the burgeoning electricity demand. Eminent industry players operating in the industry include Godrej, Schneider Electric, Eaton. Larsen & Toubro, Legrand, Siemens, General Electric, C&S Electric, Naxso, Megabarre, Effibar and DBTS.